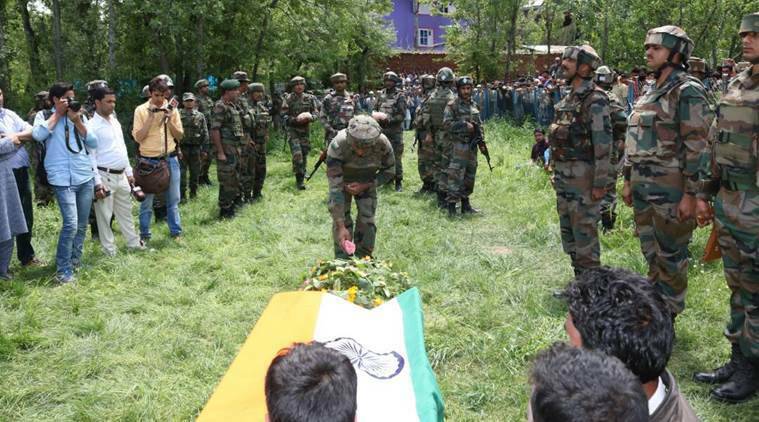 A 23-year-old Lieutenant-rank Army officer, identified as Ummer Fayaz, was shot dead by militants in south Kashmir’s Shopian district late Tuesday. Fayaz’s bullet-riddled body was found early Wednesday. 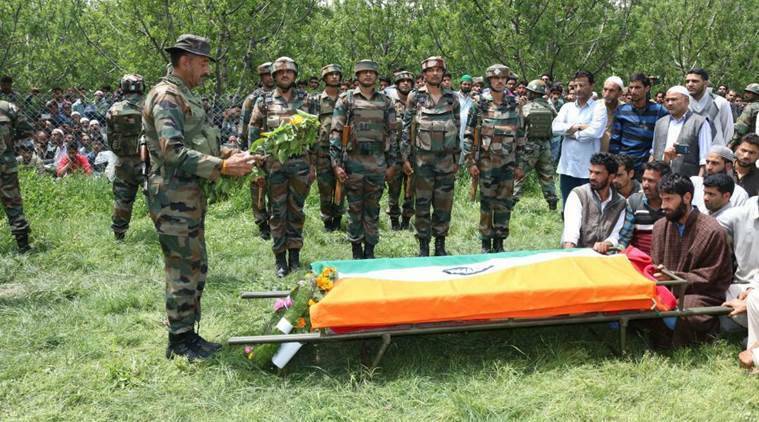 He was commissioned in the services just six months ago, said sources in the Army. The officer was on leave and had gone to attend the wedding of his maternal uncle’s daughter when he was abducted around 10 pm Tuesday. He was posted with a RAJRIF unit in Akhnoor. 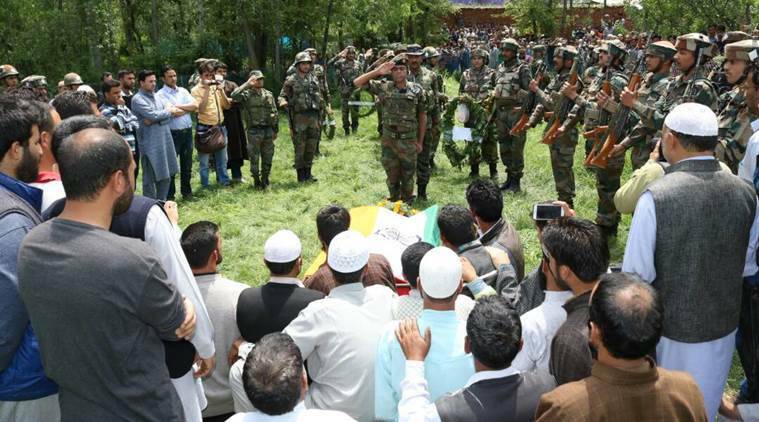 After undergoing the postmortem examination at a district hospital in Shopian , Fayaz’s body was brought to Sursun for burial with military honours. The officer’s father is a farmer and has a small-time apple business. Fayaz’s burial got completed at around 1 pm. 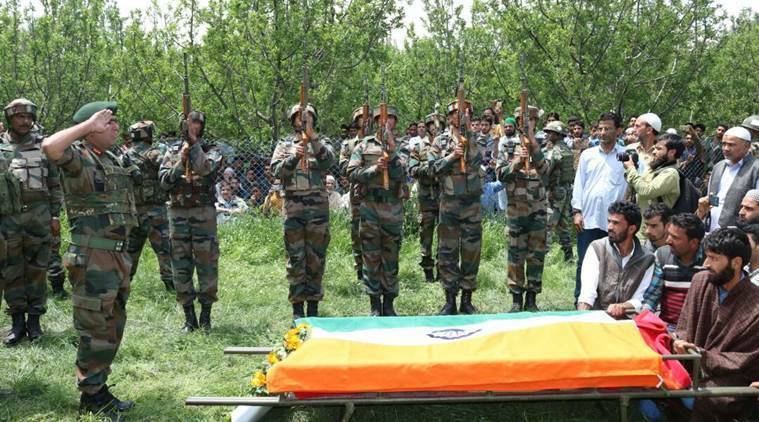 Approx 400 civilians, 250 army persons and CO attended the funeral. Guard of honour was given and three nominated persons fired three rounds each as gun salute. A total of 12 wreaths were laid on behalf of COAS, Army Commander, Corps Commander, GOCs & other Commanders. From civil administration side, SSP Kulgam and one Tehsildar were present, said a local commander. 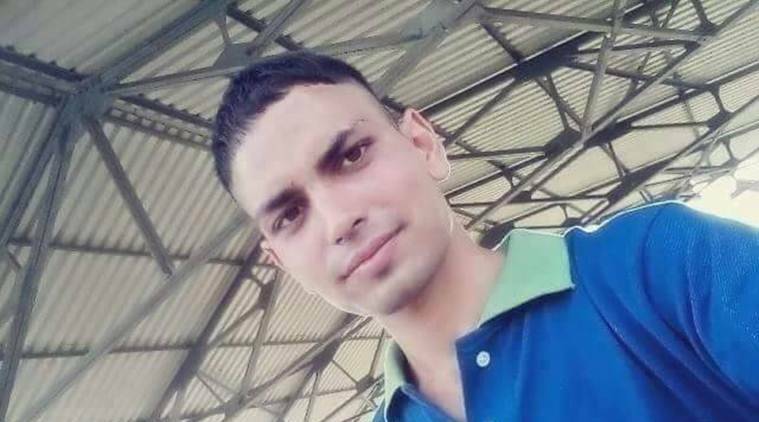 Fayaz, an ex-National Defence Academy (NDA) cadet, was scheduled to go for a ‘Young Officers Course’ in September. At NDA, he was part of the hockey team. “Fayaz was an exceptional sportsman, his sacrifice reiterates nation’s commitment to eliminate terrorism from the Valley”, he said. Meanwhile, Jammu and Kashmir CM Mehbooba Mufti also condemned the killing of Lt Ummer Fayaz. There has been a spike in attacks at security forces in recent months following which J&K DGP’s office sent out an advisory to its officers asking them to avoid visiting their homes “for the next few months”, especially in south Kashmir. “Police personnel, especially from south Kashmir, are advised to exercise extreme caution while visiting their homes. They should preferably avoid visiting their homes for the next few months,” the communication sent in April stated. The Indian Express has also reported on how militants had barged into the houses of at least five police officers in south and central Kashmir, asking them to quit the force or face the consequences. One policeman was asked to announce his resignation from the loudspeaker of the local mosque.